North Korea has fired its highest-ever intercontinental ballistic missile and poses a worldwide threat, US Secretary of Defence James Mattis has said. The missile, launched early on Wednesday, landed in Japanese waters. It reached an altitude of 4,500km (2,800 miles) and flew 960km, according to South Korea's military. It was the latest in a series of weapons tests that has raised tensions. Pyongyang last launched a ballistic missile in September. It also conducted its sixth nuclear test that month. North Korea has continued to develop its nuclear and missile programme despite global condemnation and sanctions. The UN Security Council is due to convene an emergency session to discuss the latest test. 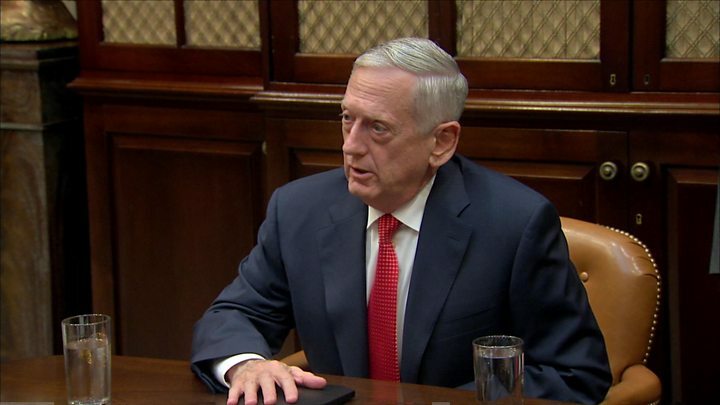 Mr Mattis said the missile launch "went higher, frankly, than any previous shots they have taken". The North was building "ballistic missiles that threaten everywhere in the world", he added. US President Donald Trump was briefed while the missile was still in the air, the White House said. Afterwards he said: "We will take care of it." The US-based Union of Concerned Scientists said the missile could have travelled more than 13,000km on a standard trajectory, thus reaching "any part of the continental United States". But it added it seemed likely that the missile had a very light mock warhead - which meant that it could be incapable of carrying a nuclear warhead, which is much heavier, for that distance. Wednesday's missile was launched from Pyongsong, in South Pyongan province, reported South Korean news agency Yonhap. Japanese officials said the projectile travelled for about 50 minutes - but did not fly over Japan, as some have done in the past - and landed about 250km off its northern coast. 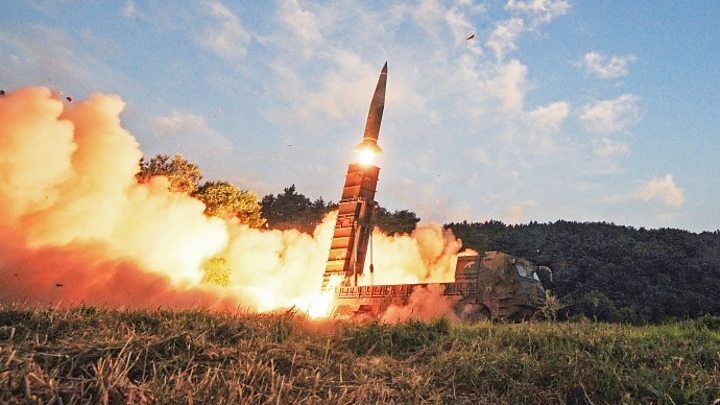 Japan also said it would "never accept North Korea's continuous provocative behaviour", while South Korea condemned the launch and responded with a missile exercise of its own. The EU has called the launch a "further unacceptable violation" of North Korea's international obligations, while Britain's ambassador to the UN called it "a reckless act". This missile test, the first for some two months, suggests that the lull in firings was not due to North Korea being cowed by Mr Trump's rhetoric or even by Chinese pressure. Experts have indeed pointed to similar seasonal slowdowns in testing in the past. President Trump, responding to the test, says that his administration will handle it. But handle it how? The US has called for an urgent meeting of the UN Security Council. And Secretary of State Rex Tillerson has spoken of stepping up the pressure on Pyongyang. But North Korea is already one of the most isolated and heavily sanctioned states in the world. There are few new levers to pull. North Korea is seemingly a problem without a solution and its nuclear and missile programmes are now, once again, back at the top of the Trump administration's security agenda. North Korea's last nuclear test reportedly involved a miniaturised hydrogen bomb that could be loaded onto a long-range missile. Last week, Mr Trump announced that the US was re-designating North Korea a state sponsor of terrorism because of its missile and nuclear programme. The US imposed fresh sanctions against Pyongyang. The measures targeted North Korean shipping operations and Chinese companies that traded with the North. 12 February - A medium-range ballistic missile launched from Banghyon air base near the west coast. It flew east towards the Sea of Japan for about 500km. 5 April - A medium-range ballistic missile fired from the eastern port of Sinpo into the Sea of Japan. South Korea's defence ministry said the missile flew about 60km. 4 July - Pyongyang claimed to have successfully tested an intercontinental ballistic missile for the first time. Officials said it reached an altitude of 2,802km and flew for 39 minutes. 29 August - North Korea fired what is thought to be its first nuclear-weapon capable ballistic missile over Japan. It was launched from near Pyongyang and reached a height of about 550km. 15 September - A ballistic missile was fired across Japan for the second time and landed in the sea off Hokkaido. It reached an altitude of about 770km and travelled 3,700km. What damage could North Korea do even without nuclear weapons? North Korea missile: How long has Japan got to defend itself?